Home Tags Posts tagged with "achma"
The last leg of our Georgian Adventures took us to the controversial Republic of Abkhazia, the self-proclaimed independent region at the Northeastern tip of the country. Let me start with some practical information (dating from July 2010) for prospective travelers. Getting there isn’t trivial. The airport is closed, and its reconstruction is being delayed for reasons both political and economic. The seaports are deserted. The train stations are in ruins, although service has now been restored between Sukhum, the capital, and the Russian city of Sochi. Riding this train on tracks that have been abandoned for nearly 20 years is probably quite an interesting experience, but I haven’t tried it. The most common point of entry is the Psou crossing point on the Russian border. With a double-entry Russian visa, you can enter Abkhazia by car or by foot here without any problem. Things become a lot more complicated if you’re on the Georgian side, like we were. There are no flights connecting Georgia and Russia. There is a boat connecting Batumi in Georgia and Sochi in Russia, but they don’t take foreigners — I was never able to clarify if foreigner means non-Georgian, non-Russian, or non-ex-Soviet, but it doesn’t matter. The only real way into Abkhazia, then, is via the Ingur crossing point. Though rather than “crossing point”, I should really call it a “cease-fire line”, since Abkhazia and Georgia are still at war. Unlike what you may have read elsewhere, this is doable. You just need a little patience! Start by applying for an Abkhazian Entry Permit here. If you’re lucky, you should get the permit in about 5 days. It is however fully possible that the lazy staffers at the ministry of foreign affairs are too busy checking their Facebook pages (literally!) or chatting over a glass of orange juice to answer you, no matter how many times you re-send your application. With that eventuality, it helps to have a hotel in Sukhum deal with the paperwork in person on your behalf— you’ll have to stay in Sukhum for some time anyway, to get a visa. If you choose to stay in Zugdidi, a taxi will take you to the Ingur crossing point in about 15 minutes, for a very small fee. The Georgian “customs officers”, a group of plainclothes cops in a black Mercedes, are actually friendly enough. They were a bit perplexed to see a group of guys from New York, Paris, and Moscow, respectively, trying to enter enemy territory together, but after telling our story 3 times and waiting for over an hour, they finally let us cross the bridge and even asked us to send them pictures — some of them grew up in Sukhum but haven’t been there for 20 years. The bridge is pretty long, with only a handful of Georgian soldiers on one side, and whole barracks of Russian soldiers on the other (sorry, no pictures allowed). The people you will see are mostly locals, going to work or shopping on the other side of the border, and the occasional UN truck with rocket impact marks on its trailer. Arriving on the other side, an armed Abkhaz custom officers verifies you entry permit, shakes you hand, and welcomes you to Abkhazia. You can arrange for a pickup with your hotel in advance, but you should be able to find a taxi to take you to Sukhum. If you choose the former, just be aware that cell phones don’t work at the border and hotel drivers won’t wait for you forever, so make your plans well ahead of time. Taxis can be pretty expensive, especially in a spot like this where you may not really have a choice. To complicate matters a bit more, you must be prepared to pay in rubles (or maybe dollars, or euros), as Abkhazia doesn’t use the Georgian Lari and the only ATM in the country (literally!) probably won’t take your card. The drive from the border to the capital takes about an hour and a half. You’ll pass many gorgeous ruins and decrepit buildings inhabited by a handful of people who decided to stay. You’ll see once-mandatory “Houses of Culture” and imposing mosaics promoting communist achievements, from the proletarian to the improbable: land surveying, jack-hammering, space travel, peace (quite ironic given the circumstances)… Forgotten mottos on the streets (“Our main goal is communism”)… It’s all there! On the way to Sukhum, Ochamchira in particular preserves many symbols of daily Soviet life: the abandoned GAI (State Automobile Inspectorate) booth, the decorated bus stop, and the clichéd sculpture. It seems like every sculpture in Abkhazia must have a marine theme, in case you need reminding that you’re by the sea. Coming next: visiting the markets and restaurants of Abkhazia! 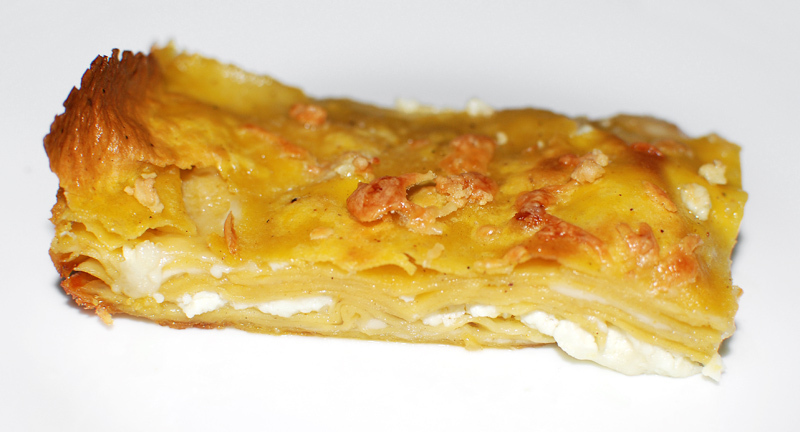 And if you can’t wait, why not try my achma recipe in the meantime? 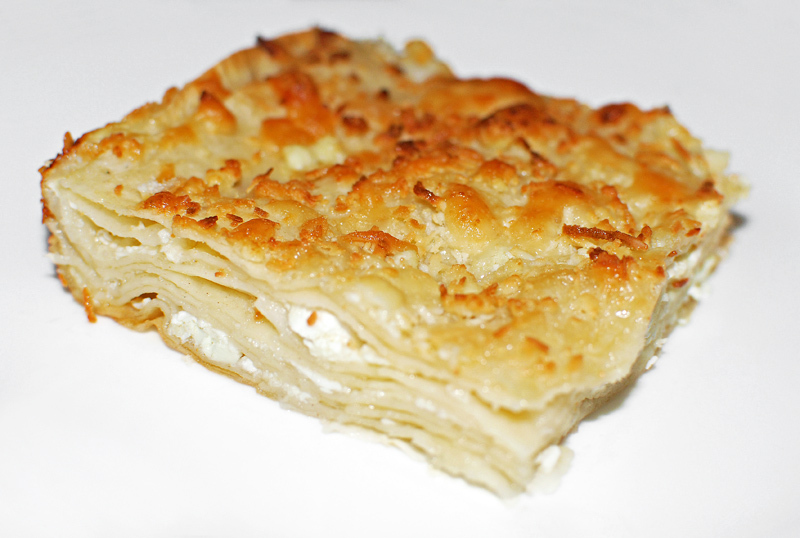 Achma is a kind of cheese lasagna found in the Adjara and Abkhazia regions, where the crisp top crust contrasts with the tender cheesy layers. Somehow, I’ve eaten more of it in Moscow than in Georgia itself, but here it is in the picture above, next to the pomegranate juice, in a food stall in Abkhazia. This is more time-consuming to make than it seems: count 2 1/2 hours from start to finish, as the assembly easily takes an hour. 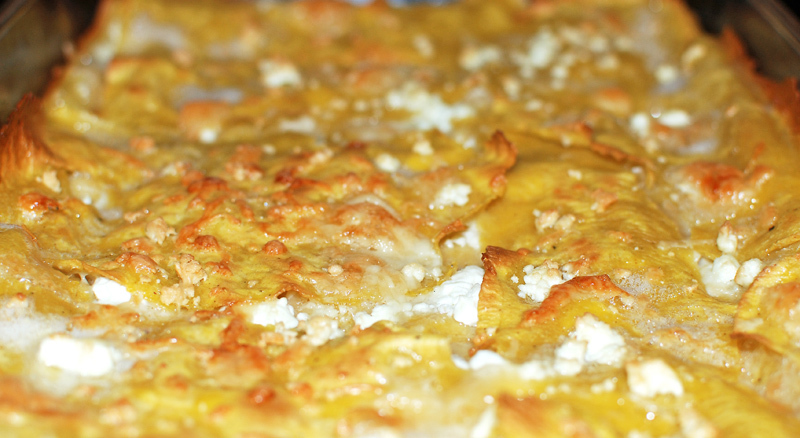 Most recipes spread the cheese mixture only on one or two layers and cover the other layers with butter, but I prefer to alternate cheese and butter layers. In Georgia, one’s choice of cheese is generally determined by local production, so feel free to experiment with any combination of rustic cheeses. It’s best to avoid mixing too many different cheeses, though, or the result will have a nondescript, generic cheesy taste that will make you regret you tried so hard. Here, I’m using two cheeses with complementary flavors: a tangy brynza (Bulgarian feta would be a good replacement) and a rich Ossau-Iraty (a firm sheep’s milk cheese from the French Pyrénées). In the bowl of an electric mixer fit with the paddle attachment, add the flour, salt and eggs, and mix over low speed until homogeneous. Add the milk, and mix for another 2 minutes. Form a ball, cover with plastic wrap, and let rest for at least 30 minutes. Divide the dough into 8 pieces. Using a pasta machine, roll each piece to the next-to-finest setting. Grease a 9″ x 13″ Pyrex pan with some of the butter. Cook one pasta sheet in salted boiling water for 1 minute, shock in ice water, pat dry with paper towels, then arrange into the dish to form 1 layer, cutting as necessary. Cover the layer with 1/4 of the butter, spread with a knife or an offset spatula. Cook and arrange another pasta sheet the same way, and top with 1/4 of the brynza and Ossau-Iraty. Repeat this procedure 3 more times. Bake the dish in a 400 F oven for 30 minutes, then finish under the broiler until brown, for 1 or 2 minutes. Let cool for a couple minutes and serve. Here is another variation for the holiday season! The butternut squash pasta dough and butter are inspired by a recipe for butternut squash cavatelli by Aki Kamozawa and H. Alexander Talbot, found here. Pierce the squash with a knife in a few places, then roast in a 350 F oven for an hour. Let cool for 30 minutes. Cut the squash in half, lengthwise. Scoop out and reserve the seeds and pulp. Remove the skin, and reserve 1 lb of the flesh. Use the rest of the flesh for another recipe. Mix the butternut squash, garam masala, nutmeg, honey and butter with a fork. 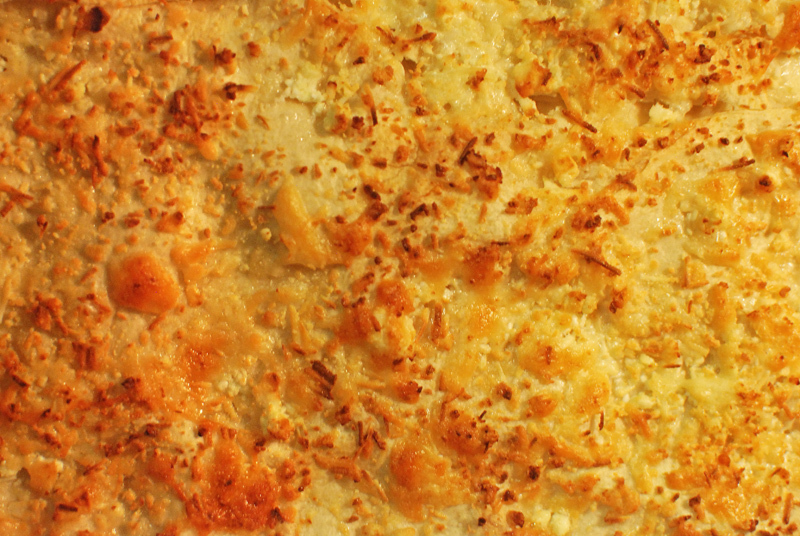 Transfer to an oven-safe dish, and bake in a 325 F oven for an hour. Let cool for an hour. Transfer to a blender and process until smooth. Measure 8 oz of the purée, and transfer to the bowl of an electric mixer fit with the paddle attachment. Add the egg and salt and mix over low speed, then incorporate the flour in 2 additions, and mix for 3 minutes. Form a ball, cover with plastic wrap, and let rest for at least 30 minutes. Place the butter and butternut squash seeds and pulp into a small saucepan, and cook in a 325 F oven for 1 hour. Pass through a chinois and reserve. Assemble and bake as the regular achma above.